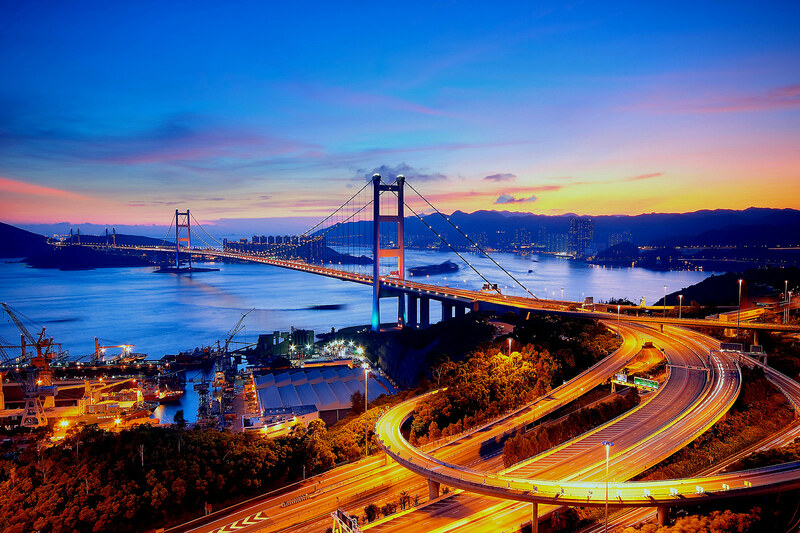 The bridge stretches from Tsing Yi Island to Ma Wan Island and has a fully suspended main span of 1.377km supported by two portal braced reinforced concrete towers 206m high. It is the longest bridge in the world to carry both a road and rail span. The 40 metre wide hybrid truss/box bridge deck has two three lane carriageways on its upper level for road traffic and on the lower (internal) deck there is two rail tracks and two protected emergency lanes for road traffic in typhoon conditions. The deck is suspended from two main cables which were formed by aerial spinning and are 1.1 m in diameter, bigger than any other cable spun to date. They pass over the main towers and are secured into massive concrete anchorages at both ends. At the top of each tower the cables are retained in steel saddles designed and machined to precisely accommodate the cable geometry and transfer the loading into the concrete towers. The deck is supported at 18 metre intervals by suspenders connected to the main cables. 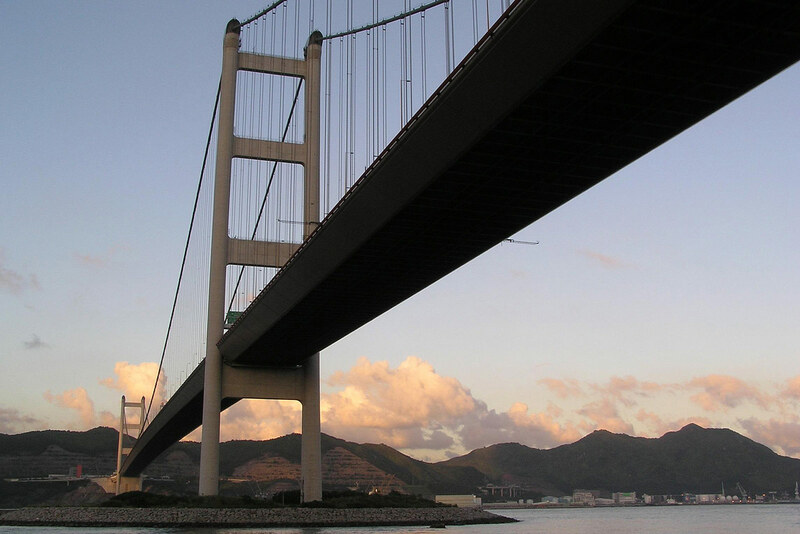 Utilisation of the cables for deck support at the Tying Yi side span is precluded by the local geometry of the deck, where its width and depth vary to accommodate the slip roads. Key elements of the design are those relating to shipping and the typhoon season. 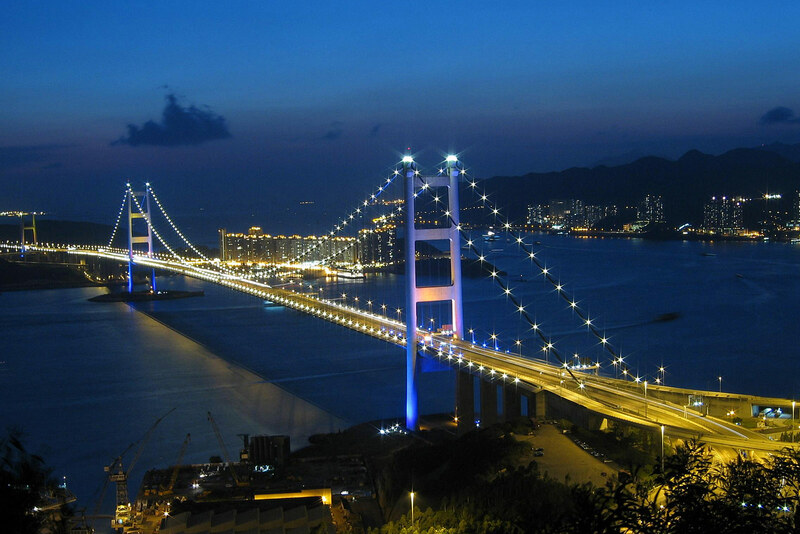 High navigational clearance to Hong Kong harbour means the main span stands 79.45 metres above mean high water. The bridge can also withstand wind speeds of up to 300 kilometres per hour.